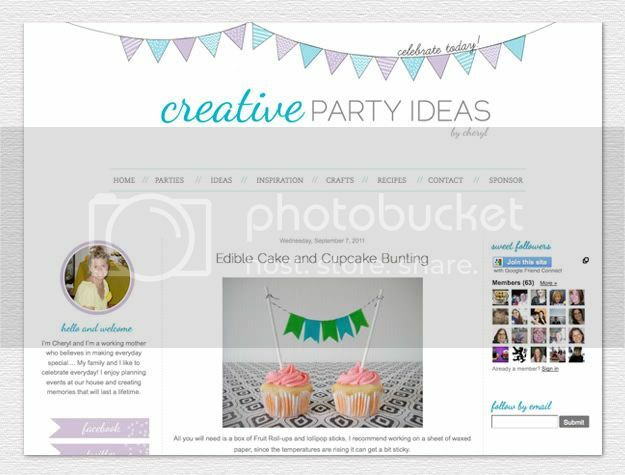 I recently finished a new blog design for Cheryl from Creative Party Ideas. Cheryl contacted me a few weeks back and asked if I would be interested in helping give her blog and twitter page a little makeover. She wanted something a little more modern, but still fun and inviting. So out with the old "scrapbook" look and in with a lighter, more simple layout! Click here to visit Cheryl's blog and take a closer look. Enjoy! So pretty! Great job. And I love her blog! great job, so simple and classy! Oh I like it so much! great job! Cute! I love simple and bright, clean layouts! You did a great job! Looks great! Enjoy your weekend. Thank you Creative Index! Jessica is amazing, fast and super talented. She has great style and super professional. I love all her special details. Great job! I love the light colors! I think the color white makes everything look so clean! Jessica, you did such a beautiful job on that blog! I LOVE the clean simplicity of it; very aestheically pleasing! I had some time to peruse your blog tonight and I really love it! I can't believe I haven't spent more time over here before (shame on me); I *love* your Art & Design category. I came across the post about Sabrina Ward Harrison and I almost jumped out of my seat; I LOVE that artist! I bought her books "Spilling Open" and "Brave on the Rocks" years ago and just fell in love with her work. So honest and raw and pure. I am working on some new art pieces and products for my Etsy shop and would love to talk with you about maybe partnering for a giveaway in the future (assuming you think it is a good fit for your blog!). I'll send you an email this week with some information and hopefully we can chat! Love this design!! Looks adorable!